← Taken by surprise – but a GOOD surprise! Oh rowboat, rowboat, wherefore art thou, little rowboat? 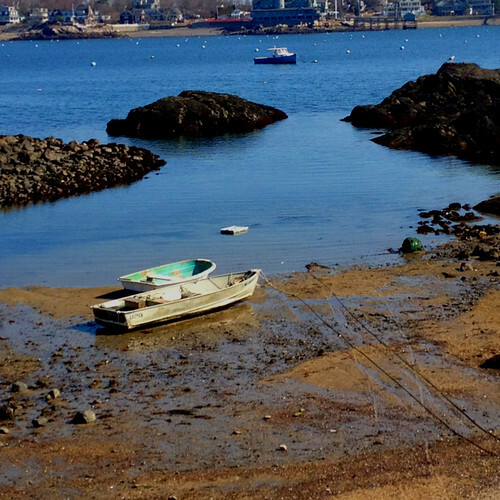 See the little rowboat in the cove above, with the pale blue/green interior? That’s Paul’s little rowboat that he uses to row out to his big boat which is out there in the harbor with the royal blue hull. We had a nor’easter here the last couple of days. Overnight, Paul lost his little rowboat. The wind wanted it and carried it off somehow. At least I think it did. This morning when he went down to check his boats, the big one was OK bobbing around in the churned up water, but the rowboat was gone. I knew this would happen. I told him to be careful, this nor’easter was not just a little thing… but he insisted that he didn’t want to take it in or bring it down-harbor. He left here about 45 minutes ago to go look again at all the places along the coast of the harbor to see if he can spot it. The tide is lower so maybe he’ll find it. So now, if he doesn’t find it, he’ll have to fork over $$ for a new one, I have no idea how much. We looked on Craig’s List but didn’t find anything he liked. He’s quite picky about boats, too. There was even one in Marblehead for sale for $75 that I think he could have used. (Note: see my comments in the Comments section here; he got the Marblehead boat!). I don’t argue any more with him. He does what he wants. So we’ve now gone thru a Hurricane/Superstorm and a Nor’easter, and he’s lost his little rowboat. He’s also lost approximately 35 traps in the ocean to the hurricane. That’s no small thing – at about $40/trap, a loss of about $1400. And he had to buy a new rowboat. But it could have been much worse. I am just going to count our blessings, and say a little prayer for the people down south of here who have suffered so much more loss than we have. Join me in saying a prayer for those souls, please? 13 Responses to Oh rowboat, rowboat, wherefore art thou, little rowboat? As for finding his missing traps, they aren’t really “missing” but rather when he brought them up out of the sea, they were mangled beyond repair so they get “cut away” and fall back into the ocean. Sounds like you both will be O.K……if only the weather cooperates and the bad storms are over. No, Ed, the rowboat had no name. I don’t think they name them around here. But if YOU were to get a little boat, a name across the back would be a good thing…(the “Nina” sounds good to me). Paul has it in the driveway now and is doing a few things to it. It will need a fiberglass job but later. Excellent! And maybe the other one will show up down the coast (this from Ed, who asks — was there a name on it?). Did I tell you — Ed really loves boats. He bought it for $75. She needs a little sprucing up but she supposedly floats so he’ll use it now. It’s fiberglass and that is work Paul can do himself. We found the boat he got under “dinghy”. He’s got the boat here in the back of his truck all ready to go fishing tomorrow. So less than a day went by without a row boat. Pretty good. Now if it will float, I’ll be a happy wifey. Ed’s at this moment looking at the Craigslist boats, that’s how much he loves boats. What did you use as searches? Dinghy? Rowboat? I don’t know how to pray, but I send all my good vibes and wishes. Yes, my thoughts and wishes also. Definitely, Bex, you and everyone who has been affected by the last two storms are in my prayers. I’m glad that is the only loss Paul has had with his livelihood. I do hope he finds it along the coastline and not all knocked up either. That’s a shame. Hope it turns up. After Sandy who could really expect another big storm so soon?